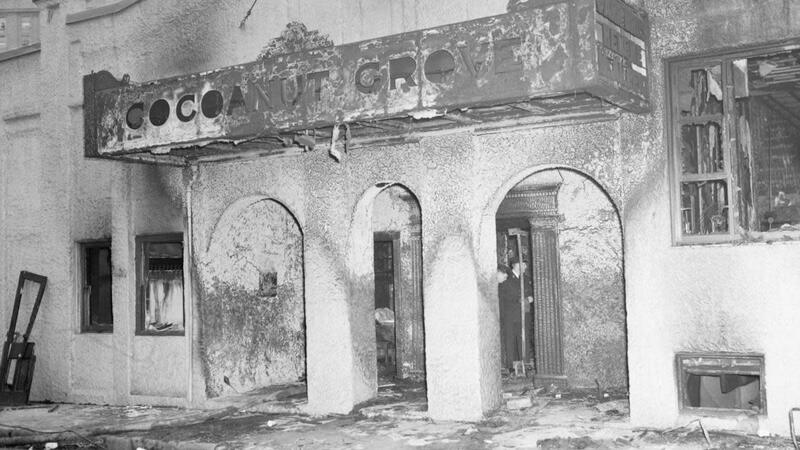 Nearly 500 patrons perished in the 1942 inferno at Boston’s Cocoanut Grove. Movie stars. Artificial palm trees. Big band music. The night of November 28, 1942, promised all the glamour and glitz that made Boston’s most famous night spot, The Cocoanut Grove, legendary. That night, about a thousand revelers gathered to drink and dance the night away. Just hours later, the club would be no more, reduced to a smoldering husk by a five-alarm fire. 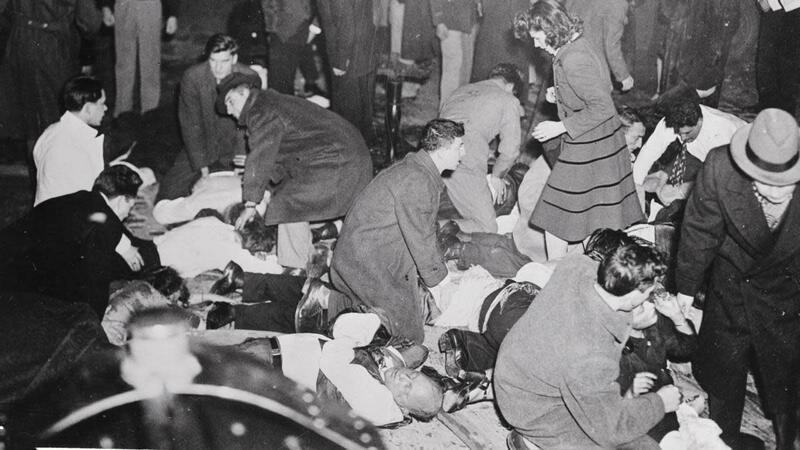 Nearly 500 people died at The Cocoanut Grove that night in the United States’ most deadly nightclub disaster. The fire was the product of a hardened entrepreneur’s greed—but for years, a young bus boy would bear the blame. 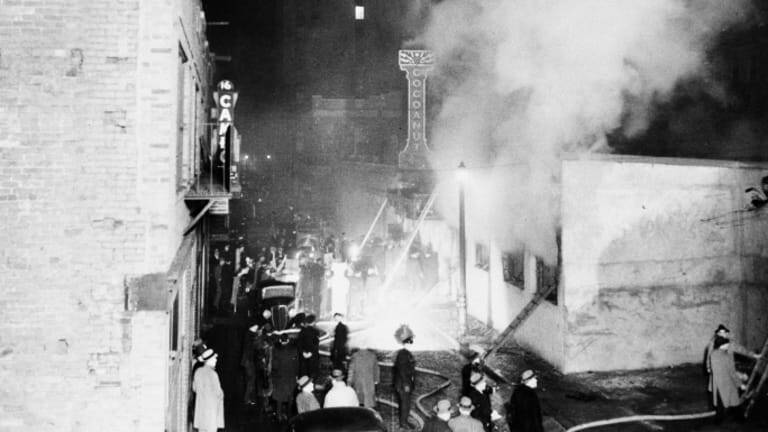 By the time of the fire, The Cocoanut Grove was a Boston institution. Singer Mickey Alpert and bandleader Jacques Renard had opened the club near Boston’s theater district in 1927, at the heyday of live music and theater. Despite the club’s prime location, it was a risky proposition. It was the height of Prohibition in the United States, and alcohol was banned. But Alpert and Renard were convinced that great music and live acts would bring people to the club even though it didn’t serve alcohol, andinsisted that the club adhere to the strict liquor laws of the day. There was just one problem: Their financier, Jack Berman, was not what he seemed. Berman was a pseudonym used by Jack Bennett, a fallen oil investor who saw the club as a way to launder money he had stolen by manipulating the stock market. The owners decided to refuse Bennett’s money and finance the club themselves. That unexpected expense, the daily grind of financing the club, and their financial inexperience meant that they were soon nearly bankrupt despite the club’s success. They sold the club to Charles “King” Solomon, a gangster, for $10,000 in 1931 (about $155,000 in today’s money). Solomon had different ideas about how to run the venue. He turned it into a speakeasy frequented by gangsters—until he found himself on the wrong end of a gun in 1933, when a rival murdered him in the restroom of another club. That’s how The Cocoanut Grove ended up in the hands of Barney Welansky, Solomon’s lawyer. In a bid for more customers, Welansky decided to try to rid The Cocoanut Grove of its gritty reputation. He invested in tiki-style decor to go along with the club’s name and convinced mainstream acts to play. Alpert became the club’s emcee, performing and running its shows. On the surface, The Cocoanut Grove was a popular, glamorous hangout for Boston’s elite and visiting public figures and movie stars. But despite its veneer of respectability, Welansky’s club was largely an expensive-seeming facade for a business that ignored building codes, hired gangsters, thugs, and unlicensed workers, and cut corners wherever possible. 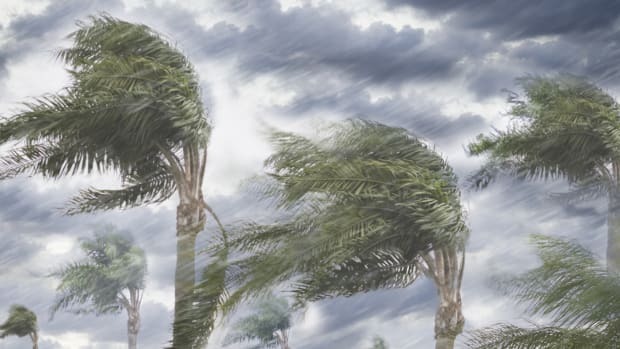 Its lavish-looking palm trees were made of cheap, flammable material and its ambience was largely due to inexpensive hanging canopies. Welansky, who had close ties to Boston’s mayor, was known to brag that he didn’t need to obey the building code. He nailed some exits shut so customers couldn’t sneak out without paying for their drinks. And he often hired underage or underpaid workers. One of those workers was a bus boy named Stanley Tomaszewski, a high schooler who worked nine-hour shifts at the club for $2.47 (about $38 in today’s money) plus tips. On the night of the fire, as football fans, the cast of a popular nearby musical, and even a movie star—Hollywood cowboy Buck Jones—crowded into the club, a bartender ordered Tomaszewski to change a lightbulb atop one of the fake palm trees in the downstairs portion of the club. The bartender had noticed a serviceman unscrewing the bulb so he could kiss his date in the dark. What happened next may never be known.Witness statements varied as to whether the bartender had asked the boy to replace the bulb, whether he did so, and whether he lit a match while doing so to see better in the darkened corner. But the results were immediate: The tree burst into flames, and one of the satin canopies that hung from the ceiling caught on fire. Waiters tried to put out the fire, but within an instant the whole club was ablaze. Chaos ensued. 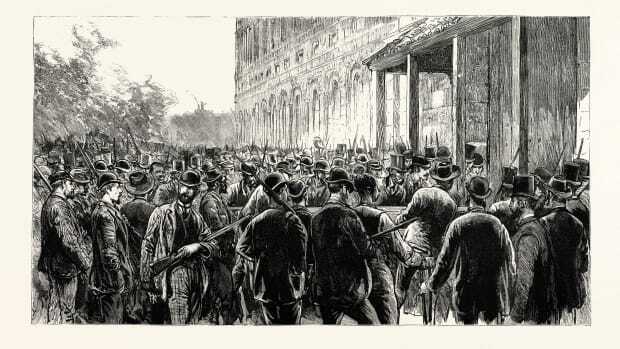 People tried to escape, only to find the exits had been locked by Welansky. They stampeded toward the revolving door at the front of the club until it was clogged with bodies. 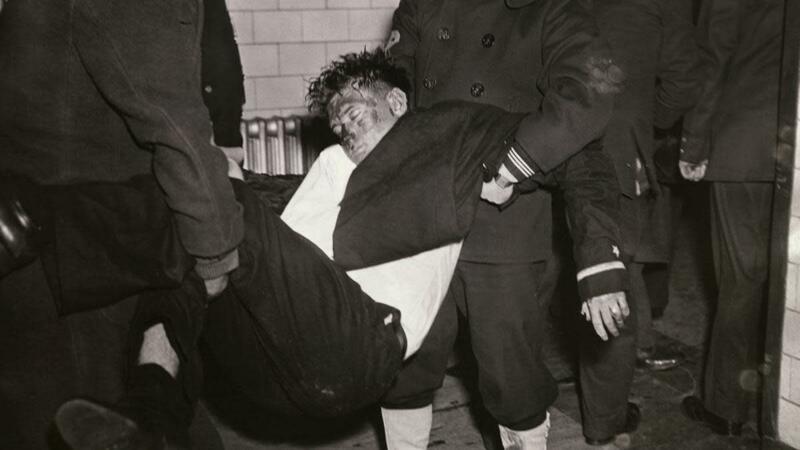 When firefighters finally made it to the building, they found stacks of corpses near the club’s doors. 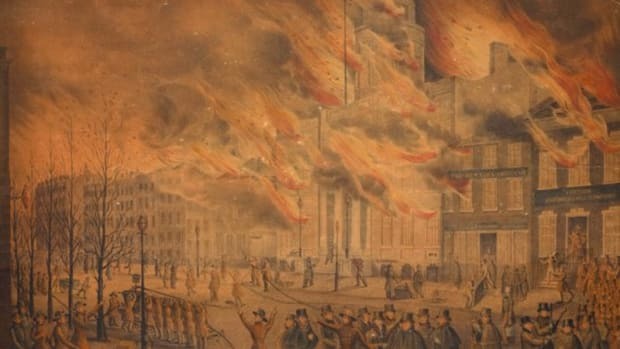 The five-alarm fire affected so many people that Massachusetts General Hospital, which treated a majority of the victims, averaged one victim per 11 seconds. Doctors were so overloaded that they decided to try out new ways to treat victims, using new drugs like penicillin and administering blood plasma—an innovative treatment at that time. “The moans of the dying were an undertone pierced by the screams of the living” at the hospital, wrote a contemporary reporter. A total of 166 people were hospitalized. 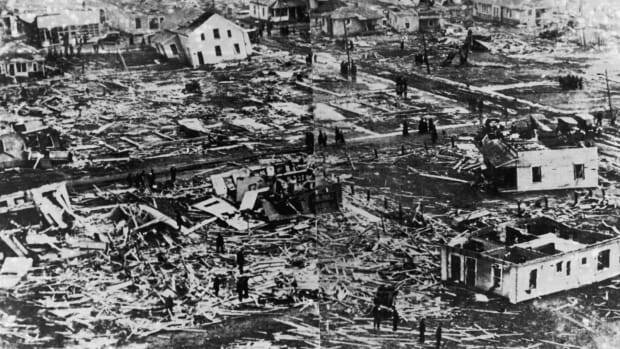 Another 300 to 350 survived, and 492 people died—more fatalities than the club’s legal capacity. After the smoke finally cleared, fire investigators at first pointed the finger at Tomaszewski, who was named in news reports. But then they cleared his name, saying that the cause of the fire could not be pinpointed. Today, historiansthink the fire was fueled by a faulty air conditioning system that pumped highly flammable gas into the nightclub during the blaze. Welansky’s greed—from the cheap materials to the shoddy wiring and inferior repairs at the club—seems to have been largely responsible for the fire’s immense death toll. He was convicted of 19 counts of manslaughter for his negligence. In the aftermath, officials learned that the building had been given a “good” fire rating the week before the blaze. The fire itself led to changes in fire law. States like Massachusetts now require buildings to have clearly marked exits and outward swinging doors, and forbid revolving doors as the main entrance of a building without nearby doors. Likewise, highly flammable decorations like the ones used by Welansky are now forbidden. 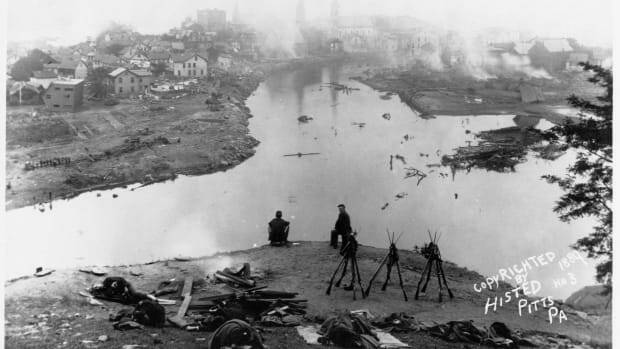 As for Tomaszewski, he lived a lifetime as the fire’s scapegoat—even though the cause of the fire is still considered an unsolved mystery. “I’ve suffered enough—[been] spit on, called every name in the book and threatened,” he told a reporter in 1972. Tomaszewski visited the graves of the people who died in the fire often, and carried the stigma of his involvement with the nightclub for the rest of his life. As for Welansky, he served a few years in prison. He died soon after he waspardoned by Governor Maurice J. Tobin of Massachusetts—the very mayor whose patronage Welansky had enjoyed at the time of the fire.